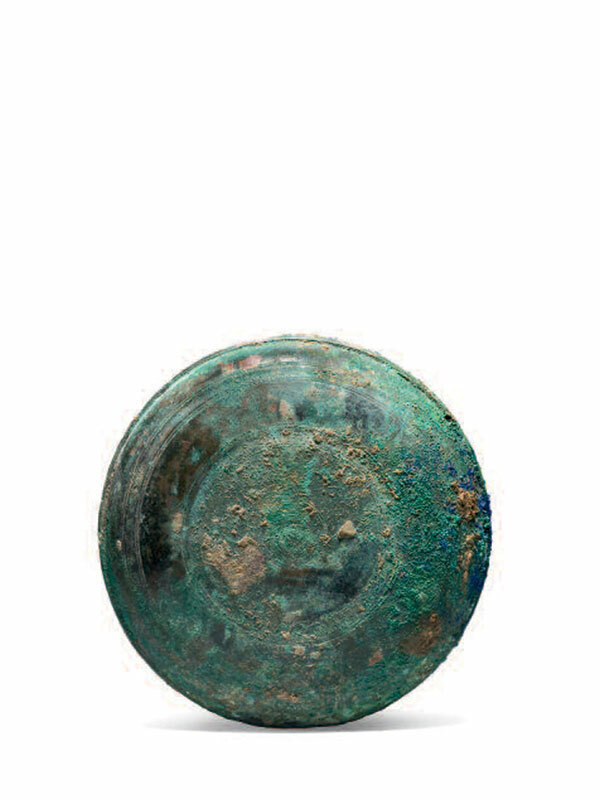 A circular bronze box with flat base, straight sides, and slightly domed cover with a concave centre. 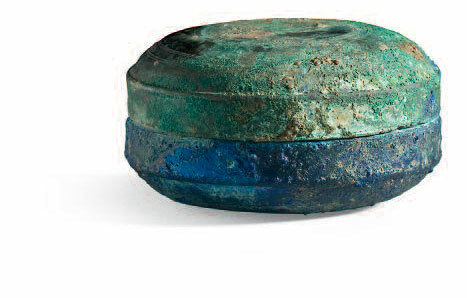 The box is completely unadorned and the grey metal is predominantly covered in an attractive green patina with areas of lapis lazuli encrustation. When trade along the Silk Route was established during the Tang dynasty, China witnessed a period of greater contact with the outside world and with this came an influx of foreign goods. This shift caused the Chinese literati in particular to reassess the value placed on their material culture, and so was born an interest in collecting Bronze Age antiquities and at the same time the creation of new bronze pieces for ornamental and practical purposes, such as this appealing box. The pure and simple form of this box originates in metal, but the exact same shape later inspired craftsmen to recreate it in ceramic, as can be seen from several white glazed examples from private Japanese collections, included in an exhibition at the Aichi Society for the Study of Chinese Ceramics in Japan in 2007. A closely comparable Tang dynasty bronze box of slightly smaller proportions was included in the 1999 exhibition Tin-bronze of China at the Kuboso Memorial Museum of Art in Izumi, Japan.